In welding, hydrogen is generated from the dissociation of water vapor or hydrocarbons in the welding arc. Metals such as steel and aluminum at or near their melting temperatures diffuse hydrogen at a very high rate. Therefore, the molten weld metal can rapidly pick up hydrogen from the hot gas in the arc. Once in the weld metal, hydrogen atoms can diffuse swiftly into the heat-affected zone (HAZ) of the base metal, as diffusible hydrogen ([H]D), because their diameter is much smaller than the lattice size of the metals. Metals reject [H]D during cooling and phase transformation, whereupon it concentrates at microstructural dislocations and voids in the matrix. The driving force to form diatomic or molecular hydrogen in the voids is so great that pressure may increase. This induces localized tensile stresses that add to residual tensile stresses. The [H]D content of weld metal has been measured by several methods: glycerol displacement as per JIS Z 3118, mercury displacement as per ISO 3690 and AWS A4.3, and gas chromatography as per JIS Z 3118, ISO 3690, and AWS A4.3. However, the glycerol displacement method has the problem of low accuracy in measuring a low amount of [H]D (2 ml/100g or less), and the mercury displacement method has the problem of environmental pollution. By contrast, the gas chromatography has no such problems. This is why, today, the gas chromatography is commonly used for measuring the [H]D content of the weld metals produced by the SMAW, GMAW, FCAW and SAW processes. With the gas chromatography method specified by the JIS standard, a small steel piece, e.g. 10T×15W×30L for SMAW, is welded with a single bead using the covered electrode to be tested. Soon after the welding, the weld specimen is cooled in ice water and is cleaned with a wire brush. Then, the weld specimen is put in the hydrogen-collecting container, followed by the argon purging to remove the air in the container. 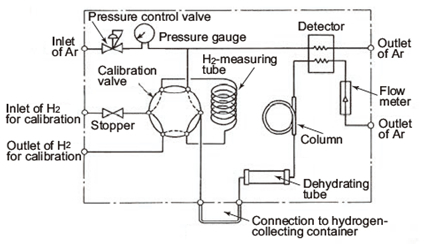 The hydrogen-collecting container is kept for 72 hours in the constant-temperature (45°C) container to collect [H]D. To measure the amount of [H]D, the hydrogen-collecting container is connected to the measuring apparatus as shown in Figure 1. Figure 1: Instrumental components of the gas chromatography method for determining the [H]D content of weld specimens. [H]D can be a cause of hydrogen cracking (also known as underbead, cold, or delayed cracking). Hydrogen cracking can occur when welding carbon and low-alloy steels. The potential for hydrogen cracking in the weld metal and HAZ depends on their composition, [H]D content, and stress level. It generally occur at a temperature below 150°C immediately upon cooling or after a period of several hours with the combined presence of susceptible microstructure, high amounts of [H]D, and high tensile stress. Moisture and other hydrogenous compounds can dissociate in the welding arc and introduce [H]D in the weld metal. Possible sources include moisture in the electrode covering, welding flux, shielding gas, or contaminants in the filler or base metal. The filler wire or rod itself may be a source of contamination stemming from the lubricants used during the wire-drawing operation. (1) Use low hydrogen welding consumables and, more preferably, extra-low and ultra-low hydrogen welding consumables. Also recommended are low-moisture- absorbing welding consumables which can resist moisture pickup for extended time periods under conditions of high atmospheric humidity. (2) Store and re-dry the welding consumables according to the manufacturers’ recommendations. (3) Clean the welding groove and the area around it carefully and properly to remove such hydrogen sources as rust, oil, paint, rainwater, and dew. Welding Handbook, Vol 4, 8th Edition, P4-5, 1998, AWS.